The purpose of the Cambridge Edition is to offer translations of the best modern German edition of Kant's work in a uniform format suitable for Kant scholars. When complete (fourteen volumes are currently envisaged) the edition will include all of Kant's published writings and a generous selection from the unpublished writings such as the Opus postumum, handschriftliche Nachlass, lectures, and correspondence. 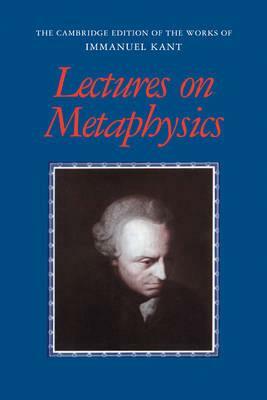 This volume contains the first translation into English of notes from Kant's lectures on metaphysics. These lectures, dating from the 1760s to the 1790s, touch on all the major topics and phases of Kant's philosophy. Most of these notes have appeared only recently in the German Academy Edition; this translation offers many corrections of that edition. As is standard with the volumes in the Cambridge Edition there is an extensive editorial apparatus, including extensive linguistic and explanatory notes, a detailed subject index, and glossaries of key terms. 1. Metaphysik Herder (selections) [Ak. 28: 39-53]; 2. Metaphysik L1 (complete except for the Natural Theology and Heinze extracts) [Ak.28: 195-301]; 3. Metaphysik Mrongovius (complete except for the Natural Theology) [Ak.29: 747-940]; 4. Metaphysik Volckmann (selections) [AK. 28: 440-50]; 5. Metaphysic L2 (complete except for the Natural Theology) [AK. 28: 531-94]; 6. Metaphysic Dohna (selections) [Ak. 28: 656-90]; 7. Metaphysik K2 (selections) [Ak.28: 753-75]; 8. Metaphysik Vigilantius (K3) (complete except for the Natural Theology) [Ak.29: 941-1040].